I’ve read numerous articles about the fabled green drake hatch on Penns Creek as well as heard stories from my friend Jeff Shafer. Frankly I was a bit intimidated by the whole experience; huge mayflies everywhere and difficult to imitate with crowds of other fishermen bordered on a circus rather than a fly fishing experience. Eastern green drakes have bodies over an inch in length and huge light green wings and are imitated by size eight flies. They begin to emerge near the junction with the Susquehanna River and move upstream over a weeks’ period of time and attract a posse of fly fishermen that attempt to migrate upstream along with the hatch. This annual one week event typically coincides with Memorial Day weekend, but can occur earlier or later depending on the spring weather in central Pennsylvania. I received my reunion package in the mail from Bucknell University in February and decided in April to make the trip in May. I emailed my Bucknell friends and checked to see who would be joining me for number 40. Bucknell is located in Lewisburg, Pa. approximately 45 minutes east of Penns Creek, and can serve as a convenient jumping off point for fishing ventures. I discovered that several of my friends, Jeff Yingling and Bill Hicks, would be joining me for reunion weekend, so I made my online reservations for the weekend activities and reserved a dorm room for Thursday, Friday and Saturday nights. At the same time I emailed my fishing friend Jeff Shafer who lives in Whitehall, Pa. and let him know that I would be in central Pa. at the end of May and the beginning of June. Jeff quickly replied that he would block out the days that I would be there and join me for some fishing. In addition to attending the reunion and fishing, I also planned to visit my good friend Don Batchelor in State College, Pa. and also spend time with my brother Jim in Lititz, Pa. and my sister Marcia near Topton, Pa. This trip unlike the 2012 trip was primarily focused on visiting friends and family with the secondary benefit of a few days of fishing. In the end my itinerary worked out like this. Fly to Philadelphia on May 28, the day after Memorial Day and drive to Lititz to spend the night at my brother’s house. On Wednesday morning I would drive to State College and spend the day with my friend Don Batchelor and while there purchase a submarine sandwich and food for lunch and dinner the next day. Thursday morning I would travel on route 45 from State College to Penns Creek and meet Jeff Shafer who was traveling from Whitehall, Pa.
We planned to fish from morning until after dark and then drive to Lewisburg where we would stay in the dorm room I reserved. 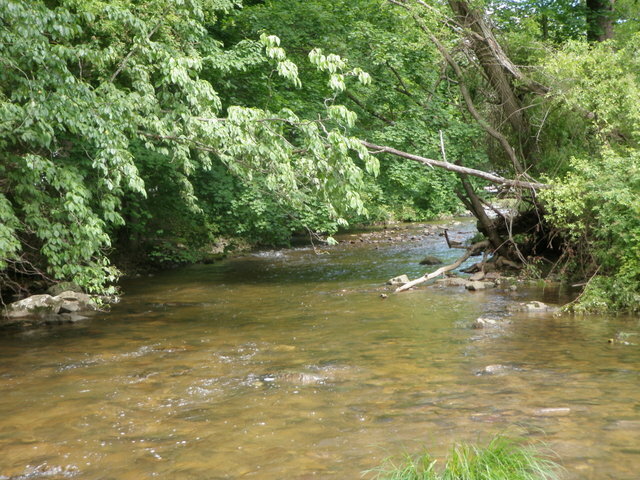 Friday featured a return to Penns Creek for a day of fishing; however, I would depart the stream by 4-5PM to join some fraternity brothers at a cookout at a friend’s house just south of Lewisburg. Saturday’s schedule was filled with reunion activiities and then after brunch on Sunday on campus, I planned to travel south to Lititz and spend a day with my brother and sister-in-law. Monday entailed a drive to Topton where I would spend the day and evening with my sister Marcia and brother-in-law Greg before driving to Philadelphia on Tuesday for a return flight to Denver. With these plans etched in stone, it was a matter of waiting for the time to arrive. Could all the variables line up so that I’d experience the fabled green drake hatch and spinner fall on Penns Creek? Would it be early or late in 2013? Would there be hordes of fishermen to contend with? Would the weather create good conditions or dump ridiculous amounts of rain on the area causing the stream to rise and become the color of chocolate milk? 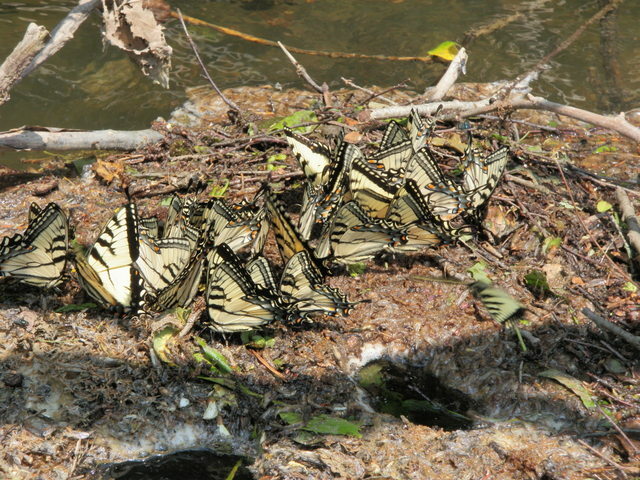 A week before my trip my friend Jeff sent me an email announcing that green drakes were cited near the mouth and they had begun their upstream movement. Jeff suggested that the green drakes might be in the no kill area near Weikert by the end of the following week when we planned to fish. Some storms passed through the area on Memorial Day Weekend, but the stream levels were largely unaffected. Memorial Day Weekend occured early in 2013 and we planned to be on the stream during weekdays after the big holiday. In the day or two before departure Jeff and I worked out a system for connecting on the stream on Thursday despite the fact that we were departing from separate points east and west of our destination. Jeff would bring his walkie talkies along and place one on the driver’s seat. I would find the hidden key to the minivan and then contact him via walkie talkie to find his position. Everything went according to plan as I purchased my food items in State College and had a nice visit with Don on Wednesday, and I had my fishing bag packed with all the essentials on Wednesday eveing. The only disturbance to our plan was a weather forecast calling for a four day heat wave from Wednesday through Saturday with high temperatures in the 90’s and high humidity and little cloud cover. I woke up at six AM on Thursday morning and grabbed a quick breakfast while Don slept. I arrived at the parking pullout near Little Mountain lane by 7:30 and immediately jumped into my waders and assembled my rod. Jeff being the perfect fishing companion that he is, had the hidden key where he told me it would be. 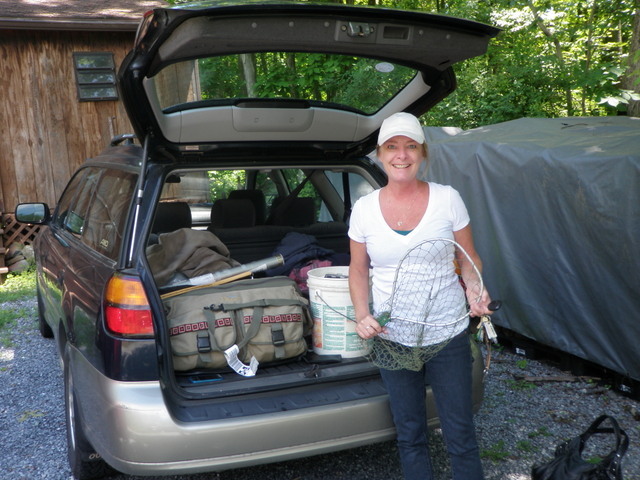 I unlocked the minivan and found the 2-way radio on the driver’s seat along with a box of seasonal flies that were guaranteed to produce at the end of May on Penns Creek. The broomstick wading staff was available to me in the rear of the van. I was off in an instant and walked down Little Mountain Lane to find Jeff. Sure enough in the long pool at the end of the lane, Jeff was waded half way across the creek and casting green drake spinners to rising fish. I took a position fifty feet below him and spotted some nice rising fish. As I watched the water closely I observed some huge mayflies riding the surface currents and slowly lifting into the air. I’d succeeded in meeting the green drake hatch! I tied on one of the foam body green drake adults that Jeff included in his fly box for me and waded one third of the way into the pool. I began seeing sporadic rises downstream and a bit across from me, so I made quite a few casts but eventually hooked and landed a small brown. This scenario repeated itself three more times in the tail of the nice pool at the base of Little Mountain, and then Jeff suggested we cross and move downstream. We did this and bypassed a nice riffle stretch and then cut back to the stream where there were some small islands and some cabins on the far bank. Another fisherman was on our side so we circled around him and moved into the stream below. As I continued to fish Jeff shouted out that he was noticing some sporadic isonychia emerging, and I was observing far fewer green drakes on the water. I decided to add a size 12 prince nymph dropper eighteen inches below the foam green drake to imitate the isonychia nymph. This proved to be effective and I landed two feisty stocked rainbow trout and then moved upstream to some nice water that Jeff suggested I cover. Here in a small pool I landed three more small browns on the prince nymph dropper. Meanwhile a group of six or seven fishermen appeared above me and blocked further advancement, so Jeff and I circled above them. We fished for the remainder of the morning until approximately 12:15 when I persuaded Jeff to return with me to the car for lunch. We decided that we would take our lunches to the sportsman’s club and eat there while waiting for Bob to arrive. As luck would have it, Bob was pulling into the parking lot in his Jeep Wrangler just as we arrived, and I introduced Jeff to Bob, and we finished our lunches then followed Bob to the end of Aimeti Lane where we parked next to a cabin. Bob did not bring his waders or hip boots and planned to only toss spinners from shore. We followed a path through the trees and met the stream behind a neighboring cabin. I waded in a few feet at the riffle section at the top of the pool while Jeff circled around the bottom and came up the opposite side under some overhanging tree limbs. Bob meanwhile positioned himself at the midpoint of the pool and began lofting long casts across the middle current toward the opposite bank. In short order I began to notice some rises along the middle current seam, but the fish were showing no interest in my prince nymph. I clipped off the two fly combination and tied on a green drake but again my fly went unmolested while the fish continued to rise before and after my fly floated by. Jeff yelled out that he was seeing cornuta so I found one of my olive body cornuta comparaduns and tied that to my tippet. Once again my fly was ignored as trout sporadically rose to inhale something. Jeff had seen isonychia bit upstream and they emerge sparsely so perhaps that was the answer? I exchanged the cornuta imitation for a dark maroon body isonychia and executed a cast directly across and allowed the fly to drift downstream along the current seam. 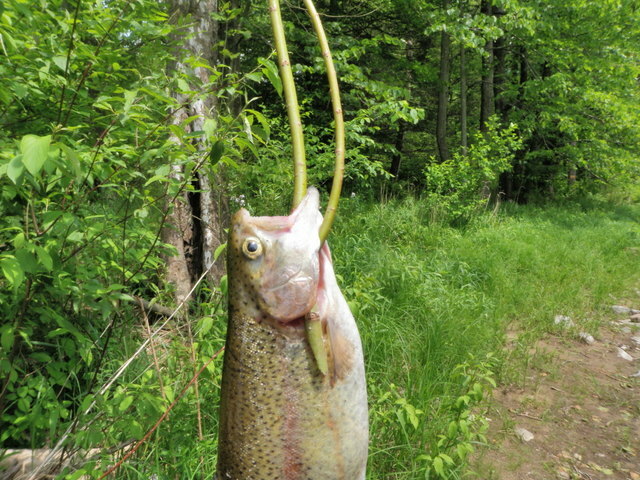 On the third such drift a trout rose and attacked the iso and I set the hook and battled a hot rainbow. Eventually I landed the hard fighter and took it to the bank to photograph; however, when I tried to remove the fly, I noticed it was quite deep and blood trickled from the rainbow’s gills. Rainbows are stocked fish and we were outside the no kill, so I decided to kill this fish as it was apparent that it would not survive if released. Bob joined me and cut a willow branch with his pocket knife and constructed a makeshift stringer. We fished a bit longer until it was approaching 3PM and then decided to adjourn to the no kill area before crowds of fishermen descended after getting out of work. I asked if Bob would take my fish back to Lewisburg and clean and bring along to the cookout at Ken Hafer’s place on Friday night. He graciously agreed and Jeff and I headed back to the no kill area. Along the way we stopped near Little Mountain so I could pick up my rental car and park in the fish commission parking lot. When we arrived the parking lot was full so we parallel parked next to the trees on the shoulder of the small dirt road leading to the parking lot. As we prepared to fish some kayakers returned from their journey and opened up some parking space, but we kept our vehicles where they were. We munched down our dinners which closely resembled our lunch and then descended to the no kill water. For the next several hours until 8PM we moved around in the area downstream of the parking lot. We encountered two fishermen but were able to find plenty of juicy water and in fact we wondered where all the occupants of the cars in the parking lot were. Jeff picked up several nice fish in excess of 15 inches including a 21 inch beauty from one of his favorite spots, but I was largely blanked and stuck on 12 fish, nearly all stockers. It was a nice fish count for a day on Penns Creek but I had yet to land one of the wild deeply colored well fed browns that I deeply craved. As darkness approached we moved to the top of a large pool and no other fishermen were present. The green drake spinners were now flying at rapid speeds up the stream at a distance of five to six feet above the water, and the grand performance began. A fish rose here and there and then as all daylight disappeared an amazing scenario played out. The stream was filled with loud smacking sounds as trout rose and feasted on the green drake spinners. Initially I could barely see my green drake spinner fly with a light yellow foam body, but this only lasted for ten minutes or so and I was surrounded by complete darkness. This didn’t stop the trout and the rapid fire sound of trout slurping and sucking down green drakes along with some air built to a loud natural drum beat. I noticed a fairly regular riser three feet from my left foot just before daylight disappeared, and I could hear this fish continuing its ravenous feeding ritual so I focused my casts in this vicinity. I simply flicked my fly a few feet out from my right leg and then listened for a slurp and set. Forty nine times I repeated this ritual which resulted in air, but as I began to despair of catching any fish, I set the hook at the sound of a smack and was amazed to feel weight on my line. Landing a large fish in darkness is a creepy experience. The fish went into a head shaking routine and made numerous short runs up and downstream, while trying to roll the line and free itself. I held tight and allowed the fish to take line several times until I eventually guided it just upstream of my position and finally got a decent look at a 16+ inch hefty brown that thrashed and splashed in a futile attempt to get free. Finally I slid my net under the beautiful wild brown, and it was gratifying to know that I’d succeeded in catching a wild Penns Creek brown on a green drake spinner. I flicked my light on briefly and the stream was blanketed with the large green drake spinners. Jeff and I estimated that there were six spinners for every square foot of surface area. The other amazing thing was the recurring thud that I felt as these behemoth flies flew upstream and crashed into my rod. The entire scene was a unique and entertaining natural experience. I released my prize catch and heard another fish rising a few feet above me and also quite close so this became my next target. The same repetitive process played out with unproductive cast after unproductive cast executed. It was as if I was thrashing the water with no apparent goal in mind. But eventually on one of my lifts to recast I again felt weight and again a fish began to battle up and down the stream in the total blackness. What was on the end of my line? I patiently held my ground and applied side pressure and once again I was fortunate to slide my net under a fat wild brown after five minutes of fighting. This fish also appeared to be 16+ inches with a large girth apparently acquired through nightly trips to the green drake smorgasbord. Meanwhile Jeff persisted and finally managed to land a fine Penns Creek brown to go along with his other catches on the evening. He estimated that he landed four browns that summed to 75 inches over the course of the evening. It was a milestone night for even this veteran of Penns Creek fishing. By 10PM the rising activity waned and we decided to carefully find our way back to the car by the light of our flashlights and headlamp. Tiny gnats were immediately attracted to our lights and covered our faces making it difficult to see where we were going, but once we climbed on to land, the tiny bugs went away and we approached the parking lot. 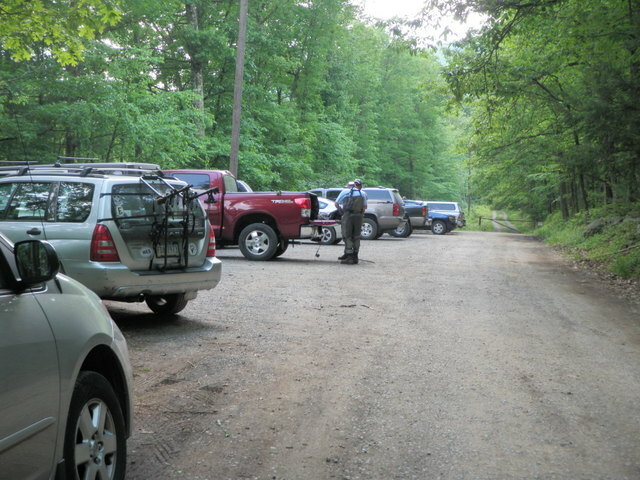 We removed our waders but left our rods set up for Friday and then drove the 45 minutes to the Bucknell campus. I had arranged to pick up the dorm key at the public safety building, so we found that, and a security guard behind the glass window gave me two keys and directed me to Roberts Hall. This is the oldest dorm at Bucknell and we soon discovered it smelled musty, did not have air conditioning and had no hot water. To say the least we were not pleased and regreted making the long drive which cost us sleep and fishing time the next day. I discovered upon registration on Friday that the woman I spoke with forgot to transfer the reunion package to public safety thus causing the frustrating night in Roberts. Despite the poor ending to our day, it was a great experience. All the variables came together and I experienced a morning green drake emergence and a thick spinner fall as darkness descended. It was truly an amazing evening and something I will never forget. 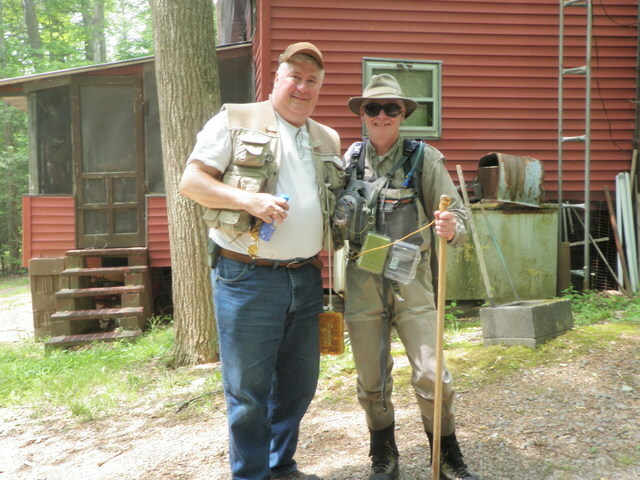 Tuesday was a day of work for Marcia so I used it as an opportunity to fish the NW Branch of the Perkiomen Creek at Forgedale only five or six miles from the Yost house. I ate a light breakfast, rounded up the dogs, and gave them a treat for their good behavior and left the house by 9:30AM. By the time I drove to Forgedale and climbed into my waders and strung my rod I began fishing at 10AM. It was another pleasant day with highs forecast to reach only the seventies again. I began fishing in some private water just below the Forgedale Park but I was only guilty of trespassing for twenty yards or so. I tied on a Chernobyl ant with a beadhead hares ear dangling from the bend. I experienced a couple refusals so I switched the Chernobyl for a yellow Letort hopper. Suddenly as I flicked an underhand cast to the middle of the tail of a nice pool beneath some large overhanging branches a twelve inch brown smashed the hopper. I photographed this fish and moved on up to the stretch next to the small park which is actually simply mowed grass between the stream and the road below a large iron bridge. I wasn’t getting much action on the BHHE so I exchanged that for a beadhead pheasant tail as I feel that better imitates the nymph of the sulfurs, and I know they are present in large numbers on this stream. I began catching small browns with increasing frequency over the next couple hours as I worked upstream to a point just opposite the state game lands parking lot where I had parked. All the fish snatched the BHPT and they were in the 7-9 inch range. It was a challenge to cast with my nine foot rod while avoiding the canopy that reached out over the stream and I lost quite a few flies in the process. I also experienced a larger than normal long distance release ratio on fish that darted out and grabbed the pheasant tail but shed the hook before I could land in my net. I needed to check in with Southwest Airlines at 1:25PM so at around 1:00PM I climbed up the bank and returned to the car to use my iPhone to get A54 as my boarding number. I drove to the Barto Hotel parking lot to obtain a better cell phone signal, and as I did so apparently passed my brother. My brother, Jim, and I had agreed to meet at the game lands parking lot so after securing my boarding number I gave him a call. We met in the Forgedale parking lot and decided to forego more fishing and returned to Marcia’s house where we hung out until Marcia and Greg returned home from work. That evening I treated Jim, Marcia, Greg and my nieces Erin and Kyra to dinner at Union Jacks. My final day in Pennsylvania was a lot of fun. Fishing on Monday was more about spending time with my sister and revisiting favorite places from my childhood than catching fish. I got up with the Shafers and had a quick breadfast before they took off for work. 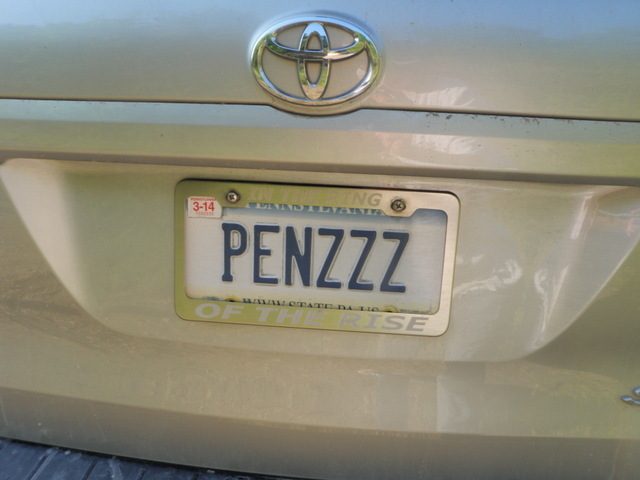 I left the house at 8:15 and drove to my sister Marcia’s house near Landis Store, Pa. I elected to take a longer route than normal so I could check out the stream conditions of the NW Branch of the Perkiomen Creek near Forgedale, Pa.
Sure enough when I drove along the stream it was clear and slightly higher than usual, but definitely fishable. I continued on to Marcia’s and was greeted enthusiastically by her two dogs, Emma and Olivia. Marcia only works at a nursery on Tuesdays and Wednesdays, so we decided to drive to a favorite Pennsylvania Dutch market to buy a few items, and then continue on to Pleasantville for lunch and then drop by the Manatawny Creek to check conditions. We executed this plan to perfection and purchased some ribs for dinner at a butcher shop next to the restaurant where we had lunch. Much to my amazement, the Manatawny Creek was essentially clear, but also somewhat higher than normal. We chanced upon two clumps of wild mint near the stream so we decided to return with our fishing rods and a pot to transplant some mint back to Marcia’s house. By the time we drove back to Marcia’s house and loaded our fishing gear into Marcia’s second Outback fishing wagon and returned to the stream it was around 2PM. It was a pleasant day with temperatures only going to the low 70’s, so I was hopeful we might catch something in the middle of the afternoon. Marcia carried her five gallon bucket containing all her fishing needs to the bank directly across from a deep hole and began lobbing power bait. Almost instantly she snagged bottom below a large stump right above the deep hole, and I tried to wade in and dislodge, but it was quite jammed and I ended up breaking her line. I was impressed as I watched my sister tie on a new hook and bait her hook. Meanwhile I decided to walk downstream a bit and enter below and work my way back to her spot with flies. I tied on a Chernobyl ant and added a beadhead hares ear dropper. I worked my way upstream with no success and arrived downstream and across from my sister who had switched from power bait to a worm. She was allowing her worm to drift downstream along the bank and underneath some overhanging brush. Suddenly she exclaimed that she felt a bump and then another. 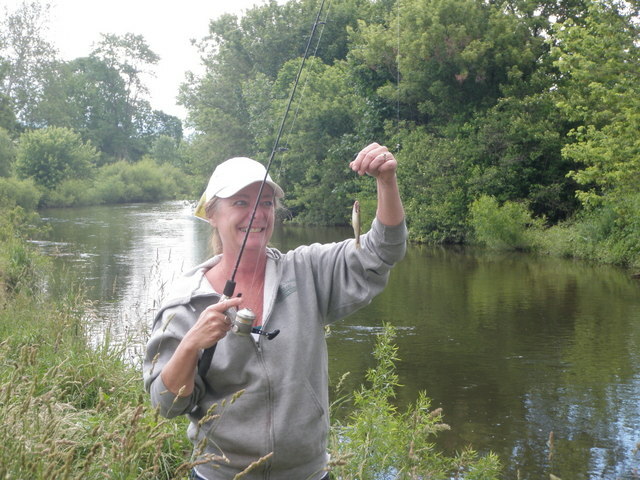 Her worm was eaten so she added a fresh morsel and let it drift downstream again, and then she shouted, “I got one”. I looked on in anxious anticipation as she reeled in a 2.5 inch chub and then asked her to pose with her trophy. I covered the deep hole with my flies and as I did that, I spotted two or three rises forty yards upstream. I exited the stream below Marcia and walked her bank to the spot where I’d spotted a rising fish. I placed some nice long upstream casts in the vicinity of the rises and thought I saw a fish refuse the Chernobyl. I clipped off the large foam attractor and tied on a size 16 olive brown deer hair caddis and several casts later brought in a four inch silver chub. I moved upstream a bit more to a place where a nice deep run ran along the left bank and under a large sycamore tree. This looked like nymph water and if there were any remaining stocker trout in the Manatawny they had to be here. I rigged up with nymphs and thoroughly covered the run, but no fish materialized, not even a chub. 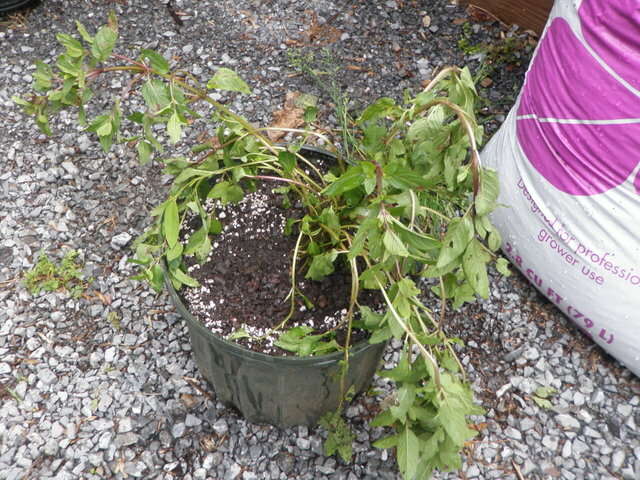 I returned to Marcia’s fishing hole and discovered her digging out some peppermint and fuzzy spearmint which she temporarily rooted in a pot for the drive home. When we got home she transplanted her “keepers” to nice pots and watered them. We laughed about our monster chubs and prepared a great dinner of barbecued ribs and a monster salad with fresh garden asparagus. I was convinced there would be no fishing on Sunday, and that I would be catching up on my reading at Jeff and Joanie’s house. I got up at around 7:15AM and went for a 50 minute run on the Ironton rail trail which I could access within two blocks of the Shafer house. We had a nice breakfast, and I watched Jeff as he changed the shank on his golf club and then made a temporary repair to his broken rod tip. I spent some time chatting with Joanie and checked out her herb garden as she clipped Italian parsley to make a batch of tabouli for dinner. After lunch Jeff remembered Cedar Creek as a stream that we might fish as it springs from the ground near Dorney Park and runs to the Little Lehigh over a short distance with minimal tributaries to affect the clarity. There is no USGS stream gauge for Cedar Creek, so we decided to take a drive without our rods and gear to assess if we could fish there. We arrived at the parking lot by the barn above the rose garden and tip toed through the muck and debris left behind by Friday’s storm to the bank. From the parking lot I thought the stream looked brown, but as we got closer we realized the brown was the stream bottom. Cedar Creek was perfectly clear and fishable! We continued up the road to Cetronia and then looped past Dorney Park and walked to the stretch that Jeff called the hog trough. Apparently some locals purchased some large trout and dumped them in Cedar Creek. We could see them beneath the surface and they did get the juices flowing as they moved about in the pool. Jeff called Joanie and asked if she could move dinner up to 5PM to allow for some evening fishing. As Jeff started the gas grill and Joanie prepared dinner, some huge dark clouds appeared in the western sky and the sound of rumbling thunder came to our ears. Eventually the rain began, and it came down in sheets again. We bunched my fishing gear toward the center of the porch so it wouldn’t get wet again. We enjoyed a wonderful pork tenderloin dinner in the dining room while the rain came down outside. After dinner we debated whether to wait out the storm or drive to Cedar Creek. I suggested we go to the stream and worst case we’d return without fishing, but best case we’d be there when the rain stopped. That was the plan we followed. We arrived at the same parking lot as earlier in the day while it continued to rain, however, at a slower pace. It didn’t take long before the rain stopped and we walked over to check out the stream. My spirits sank as I noticed the water had risen to the top of the bank and was now quite murky. 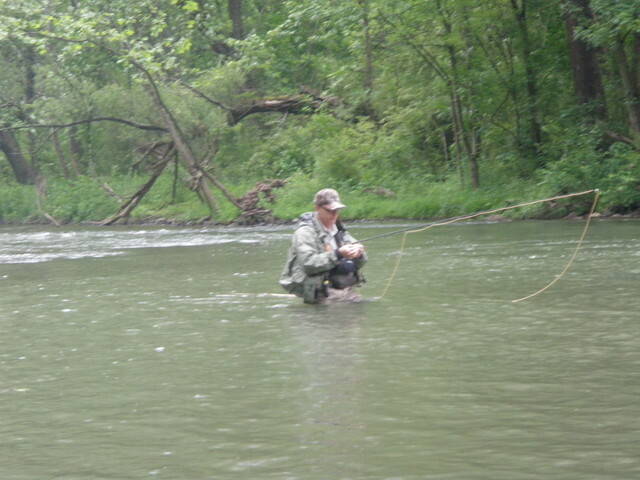 Jeff on the other hand was undeterred and suggested that we strip streamers along the bank. That’s exactly what we did. I pulled an olive woolly bugger with a black tail from my fleece book and clipped a split shot above the fly and began casting across and allowing the bugger to swing to the bank and then stripped it back toward me. I actually had one momentary hook up but then couldn’t coax any more action. I met up with Jeff and he had caught two while fishing the foot or two of slack water between the bank and faster current. He showed me the stripping and twitching technique he was using and I attempted to emulate it. Jeff also exchanged rods with me and gave me his black woolly bugger with a body made with flashy chenille. I managed another temporary connection with Jeff’s rod while he looked on but couldn’t achieve the ultimate accomplishment of a fish in my net. We fished the streamers until dark, and Jeff landed three or four fish, but I grew weary of the lack of success and we quit at 9PM and returned to Whitehall. I slept in until 10AM on Saturday, June 2 after the stormy ending to the previous day. When I appeared downstairs, Jeff asked if I wanted to fish? I was convinced that the Friday night storms had blown out every stream in Pennsylvania, but Jeff told me they were holding back water at Blue Marsh Dam in Reading and the Tulpehocken Creek, which flows from the dam, was holding steady at 350 cfs, slightly above the normal reading for early June. I was here to fish, so we decided to make the trip. Our food supplies remained in the van, so we reloaded our clothes and drove to the north side of Reading. The parking area and surroundings were greatly improved since my last visit. We munched down some snacks and climbed into our waders and grabbed our rods and descended down the bike path to the stream. We bushwhacked through some fairly dense vegetation and went to the lower end of the stretch where we found a fisherman just upstream. We observed the water for a bit and saw a fish rise three times, but agreed it was too close to the fisherman just above. We reversed course and hiked back up the path a ways to thirty yards or so above another fisherman. I decided to wade toward the far bank where there were a series of deadfalls and work a dry/dropper combination. Initially I tied on a large foam beetle, but the fly was poorly tied and the thread wraps on the head of the fly slid up over the eye. I clipped off the beetle and replaced with a Chernobyl ant for a bit and then added a beadhead hares ear. I was making some decent casts tight to the bank under overhanging branches, but there was no reward for my efforts. Jeff meanwhile was working a terrestrial tight to the right bank. I approached a nice deep run and swapped the Chernobyl for a yellow Letort hopper, but again no fish showed interest. This run looked ripe for deep nymphing so I undertook the task of clipping on a small split shot and strike indicator and added a light yellow caddis pupa and emerald caddis pupa. But before I could cast into the run, a man in a uniform arrived and began talking to Jeff. After a brief conversation he shouted that I might want to get out of the water as they were about to release water. He informed Jeff that they were raising the gate six inches every hour and the flows were expected to move from 350 cfs to over 2000! I hurriedly made some upstream casts with my pair of nymphs and then moved back toward the bank where Jeff remained and made a few casts across and down. It was evident that the flows had already increased from just a few minutes ago. I reluctantly reeled up my line and joined Jeff on the bank, and we agreed we only one choice and that was to return to the car and then to Whitehall. The highlight of Saturday was attending a pair of minor league baseball games featuring the Pawtucket Red Sox vs the Lehigh Valley Iron Pigs. The Pigs won the first game but lost the second. Jeff and I slept in the Odyssey van on Thursday night at the Union County Rod and Gun Club again. We decided to take showers and were optimistic that we could fish Penns Creek by Sunday if not Saturday as the flows continued to gradually fall to the high 700 cfs range. Meanwhile we used our smart phones to track flows and conditions on other central Pennsylvania trout streams. The Little Juniata had fallen to the 300’s, slightly above average for this time of year. Unfortunately the TCO fly shop in State College listed the Little Juniata drainage as dirty, so that raised some concerns. When I awoke I felt a definite change in the weather as the air was thick with humidity. The maintenance man at the club mentioned to Jeff that the weather forecasters were predicting two inches of rain. The woman at the small supermarket confirmed the forecast for heavy rain. We packed our gear, grabbed some breakfast and headed west to the Little Juniata River near Spruce Creek, Pa. under partly cloudy skies. The sun popped through off and on but there were also some large gray clouds in the sky. We stopped at the Spruce Creek Outfitters to buy some supplies and get advice on what flies were working and then drove along the stream. The water was a bit high and an opaque milky green color, but it appeared fishable. We parked on the left side of the road opposite the stream and hiked up the road .3 miles to a path that cut down a bank behind a house. Jeff decided to work some eddies near the road while I elected to go under the railroad overpass and explore the series of four or five nice pools on the north side of the tracks. I began fishing with a beadhead hares ear and a prince nymph with a split shot and strike indicator, but this combination didn’t produce. After thoroughly fishing one pool I switched out the prince nymph for a beadhead pheasant tail. I used one that I’d found on a tree branch that was a bit larger than my others, and it had a flash strand from the tail to the hook eye. At the top of the second pool along the inside of the current seam I foul hooked a 12 inch brown. Initially because of the lack of clarity of the water, I thought I had a monster, but once I brought it around to the edge of the stream I could see that the powerful fight resulted from being hooked in the dorsal fin. I moved up to the head of the next pool and snagged to the bottom and broke off the flashback pheasant tail. I selected the largest beadhead pheasant tail in my patch with a flashback wing case and tied it to the end of my line. Along the current seam at the top of this pool I hooked and landed a nice 13 inch brown and photographed it. 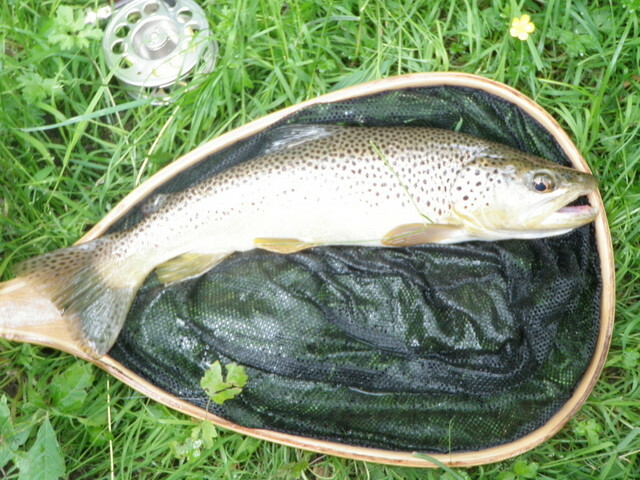 In the same general area I landed a second eight inch brown on the pheasant tail. 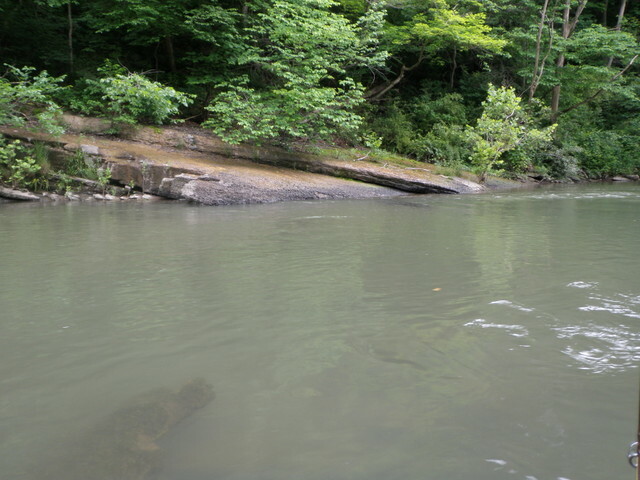 The next pool had a long flat ledge rock along the opposite bank with a large submerged rock partially visible in the cloudy water at the tail of the pool. I remembered this pool as the one I’d had good success on during my previous visit to the Little J when I landed several nice trout on a small CDC olive dry fly. I began prospecting the pool with drifts upstream and then fanned each succeeding cast outward until I had covered two thirds of the flow to the opposite bank. On perhaps the tenth drift as the flies began to swing at the tail of the pool in front of the submerged rock, the indicator darted sideways and I set the hook. I battled a nice fish and looked for signs that it wasn’t foul hooked. I was pleased to get a glimpse of the fish as it fought and clearly the line was coming from its mouth. I played the fish back and forth several times until I finally coaxed it into my net. 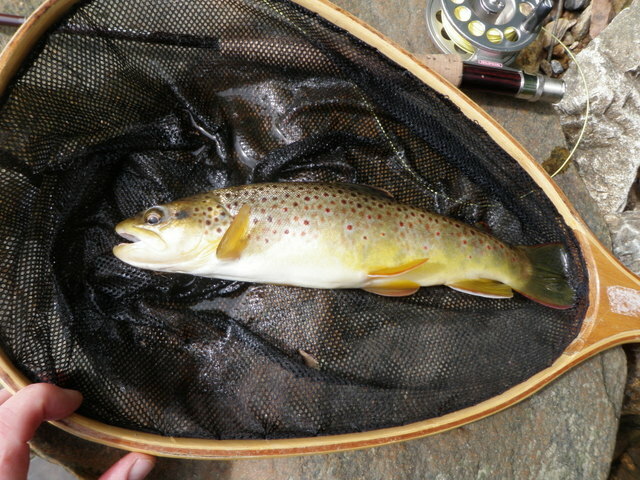 The fish stretched an inch beyond the internal width of my net, which Jeff later measured at 15 inches, so my Little Juniata brown was a sixteen inch fish, and the largest of my Pennsylvania trip. I continued working up through the remaining pool, and Jeff arrived and circled above me to the tail of a long wide smooth pool below the next railroad bridge. The river angled away from our bank over a shallow gravel bar and then dropped off to a deeper run where two currents met. I waded up along the bank to a point where I could wade out across the shallow riffles to fish the V above the junction of the currents. I had no luck in this area, but I was now positioned to fish two marginal areas along the north bank under some overhanging tree branches. 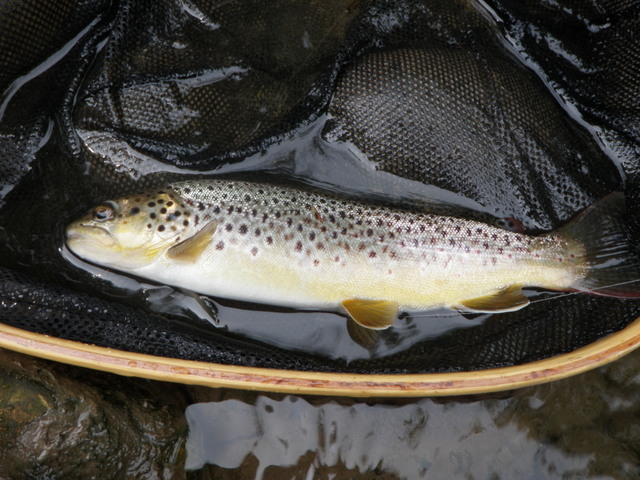 In both these small runs of three to four feet in depth I landed small eight inch browns. I continued working up along the north bank while Jeff cast from the middle toward the left side. In order to progress toward the bridge I waded through some very deep but slow water that approached the top of my waders. Just above the railroad bridge the river split into three branches that merged together under the bridge. I followed the right branch facing upstream under the bridge and then to the right. In a nice deep run here I foul hooked a ten inch brown. I was attempting to find a path up to the railroad bed so I could use the bridge to cross, but it became evident that I would have to hike quite a distance north through some dense vegetation to reach a point where the bank was short enough to gain the railroad tracks. In addition the trains were quite active, and I was concerned about being on the bridge when a train approached. I did a U turn and waded back downstream a bit, then cut up to the woods and worked my way through some dense vegetation to avoid the deep wading challenge. By this time the sky was clouding up, and I could feel light drizzle or mist occasionally. It took a while but I ended up going back in the edge of the river and wading downstream to an open area across from the large pool where someone had built a bench and a rope swing. Jeff was waiting near this point and began fishing again. I elected to continue retracing my steps to the series of pools. I stopped at the productive ledge rock pool where I’d landed the 16 inch fish and gave it another shot. I fished the pool half heartedly for a bit, and then clipped my fly to the guide and went downstream in search of Jeff who had gone back to the eddies and pockets near the road. I stopped briefly at the long riffle just above the first railroad bridge and spotted two random rises. Upon seeing these, I removed my nymphs and tied on Jeff’s parachute sulfur. It was a welcome transition to change from slinging nymphs to casting a visible dry fly, but the fish weren’t cooperative with my change in approach. After fifteen minutes or so, I reeled in my line and continued downstream in search of Jeff. I found him near the point where the river moves away from the road, and we walked back to the car together and ate our snacks for dinner. We debated where we wanted to fish for the evening hatch. Jeff suggested the nice pool across from the parking lot, but I was inclined to return to the long riffle above the bridge where I’d seen a couple rises. I changed from my sunglasses to regular glasses, put on my headlamp, and added a layer beneath my raincoat. We once again walked up the road to the same path down the bank and Jeff jumped into some sweet runs above the eddy. I continued back to the long riffle and once again began to notice sporadic rises. I drifted the sulfur over the rises to no avail so I decided to look closely at the water. I spotted quite a few small mayflies and was able to seine one using my net. 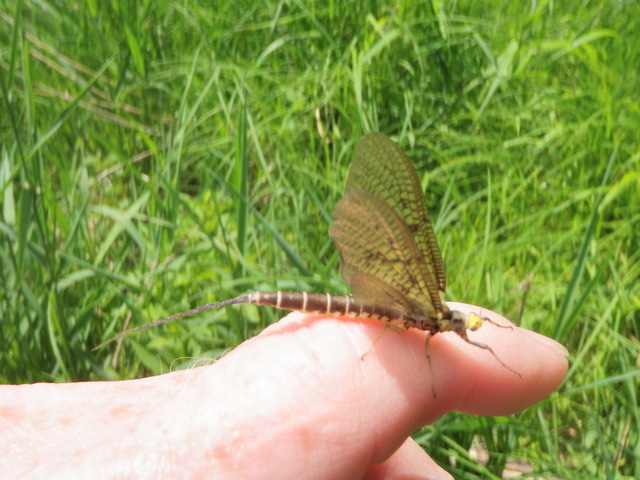 When I inspected closely I observed a size 18 or 20 mayfly with a black body and smokey gray wings with a tinge of tan. I tied on one of my CDC olives and covered the water, but my hatch matching didn’t bring any success. I decided to go back upstream to the series of pools and look for rising fish. 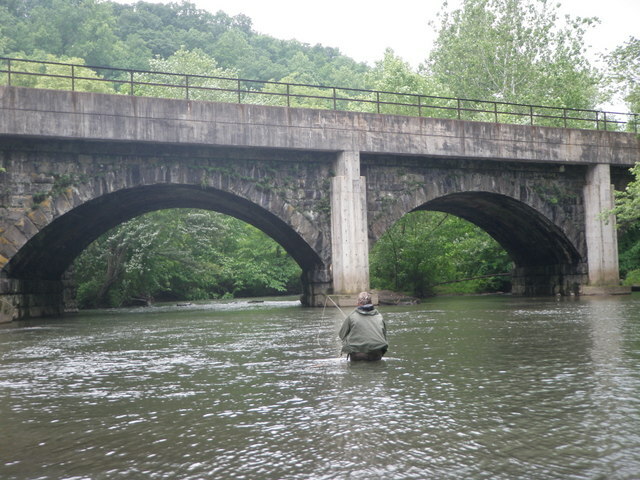 As I waited and watched the water, Eric Stroup, a local guide and expert on the Little Juniata came downstream with two clients. I asked him what we might expect for an evening hatch, and he told me the sulfurs were over and the only thing that might happen would be a cornuta spinner fall. He gave me one of his cornuta spinners and I showed him one of four I had in my box with a dark olive brown body. He told me this would probably work as well. I mentioned the black body mayflies I’d discovered earlier, and he identified them as paraleptophlebia, and he said they don’t seem to bring fish to the surface. After unsuccessfully fishing a couple of the pools, and seeing no rising fish, I decided to return and check in with Jeff. When I reached him there was a dark cloud in the northwest sky, and we could hear thunder, so we decided to walk back to the car. While doing this the wind kicked up and the leaves turned inside out and we could hear the rain hitting the leaves to the west. The rain reached us and we pulled up our hoods to avoid getting wet over the last fifty yards of our return. We quickly got out of our waders and tried to keep the car as dry as possible but it was difficult and the rain intensified and ran off the tailgate. Once we got in the car we debated what to do next. We were out of cell range so we couldn’t look at any weather radar sites nor could we check stream flows. I’d spotted the Spruce Creek Tavern as we drove through town, so we decided to stop there and check it out for dinner. The casual restaurant was quite crowded, but we were promised a 15 minute wait so we decided to stay and have a warm meal. After dinner we checked out the Marshall House B&B where we’d stayed on our last trip, but there was a For Sale sign and no one answered the doorbell when Jeff rang. We continued east on route 45 toward State College and the skies opened with steady rain pelting the minivan. When we got closer to State College where we could get a cell signal, we checked the radar and saw several bands of heavy rain north and south moving across Pennsylvania. The USGS streamflow graphs were showing vertical lines for Penns Creek and the streams in the area, so we decided to leave central Pa. and return to Whitehall where dry beds awaited us. It was a good decision as Jeff drove through waves of heavy rain on interstate 80. We arrived back at Jeff’s house at 1AM and crashed into our beds. As has happened for the previous three years, my friend Bill Hicks invited me to join him to attend a Bucknell basketball game and use one of his season tickets. 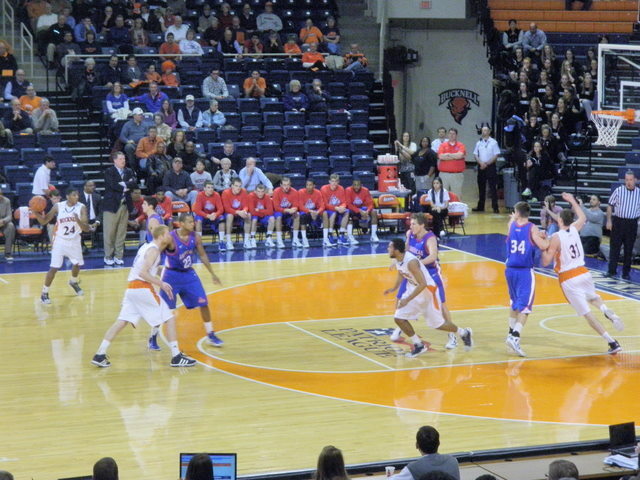 Bucknell is doing quite well this year, so I chose the January 25 date against American University. I use these visits as an opportunity to visit my brother Jim and sister-in-law Diane and my sister Marcia. I departed at 10:40AM on Tuesday from DIA on Southwest Airlines and arrived in Philadelphia on time at around 4:20PM. Because I carried my bag on, I was able to pick up my Chrysler Town and Country minivan and left the parking lot by 5:45PM. It was very mild for Philadelphia with a high temperature around 54 degrees, and I witnessed a gorgeous scarlet sunset in the western sky as I made my way toward Lititz, Pa. to stay with brother Jim for the night. I entered the wrong lane at the turnpike plaza and had to pull to the shoulder and walk back to get a ticket and avoid paying the highest fee for going from New Jersey to Ohio. I made record time and arrived at Jim’s house by 6:30PM. Diane was out to a birthday dinner with friends, so Jim and I had a delicious dinner at the Country Cupboard. The baked lima beans and cranberry relish were Pennsylvania Dutch treats. On Wednesday morning Jim and I had breakfast at the Tomato Pie Cafe in Lititz and then took a drive north to the Middle Creek State Wildlife Area. We took a short hike and snapped some pictures by one of the many lakes in the area. Next we did a big circle around the wildlife area and returned to the Hammer Creek and stopped at a covered bridge and took some more photos. The clear streams and mild weather made me wish I’d taken my fishing gear along. Next we covered some more country roads and stopped briefly at a Mennonite school house to take another picture. Finally we crossed Lititz Run and parked at the special regulation area and once again inspected the stream. Jim needed to be available by noon for his school bus driving gig, so I packed up my things and drove to Harrisburg to the Pennsylvania Automobile Association offices of Bill Hicks. Bill’s office is right next to the Susquehanna River in a pretty location. Bill and I departed from his parking lot and stopped at a casual restaurant for some lunch before driving north on route 15 to Lewisburg, Pa.
Our first stop at Bucknell was the site of our old KDR fraternity house which is now a vacant lot seeded with new grass. Next we drove up the hill behind TKE to the newly constructed KDR. The new facility is a vast improvement over the old house with a striking view of the new campus extension and the Susquehanna River. We left KDR and found a parking space in downtown Lewisburg and browsed the Barnes and Noble Bucknell book store. With a hour or so on our hands prior to meeting Ken Hafer and his guests at the Hotel Lewisburg, we stopped at the Smiling Chameleon and enjoyed a craft beer. The Lancaster milk stout I ordered was quite tasty. At 5:15PM we joined the Hafer party at the Lewisburg Hotel and had an enjoyable dinner while catching up with Ken and his business ventures. After dinner we hustled to the Sojka Fieldhouse and sat down in time for the tip off. Bucknell managed to overtake American at the end of the first half, then expanded the lead to as much as 15 during the first ten minutes of half two. American scrambled and fouled and began making three point shots to close to within four late in the game, but Bucknell began making free throws and held on for a 66-61 win. After the game Bill and I returned to his home near Hershey, Pa.
On Thursday morning I awoke to light rain and drizzle, but no freezing rain as had been feared. I had breakfast with Bill, visited with his cat Dexter, and copied a couple music CD’s to add to my collection. I departed at around 9:30 for Landis Store and arrived at sister Marcia’s house at around 10:30. Marcia and I chatted for a bit and then headed out the door to her favorite natural foods store, Echo Hill. Marcia is only working two days a week, and she has taken up making her own granola mixtures. I bought some raspberry trail mix, and we proceeded to Fleetwood where we ate lunch at a nice little lunch spot on Main Street. After returning to Marcia’s house, we chatted a bit more, and I jumped back in the rental car and departed for the Philadelphia Airport by 3PM. I arrived at the airport in plenty of time and my return flight was on time and brought me home by 9PM.